General Conference is our favorite time of the year! It's an amazing opportunity to refuel and refocus. But let's be honest, conference can be really hard to focus on and to pay attention to when there are kids involved. We have wrangled together some ideas to keep your kids actively involved in conference and to put some packets together in order to help keep your children's thoughts focused on conference and the gospel. Keep in mind that despite our best efforts and extreme preparation, children may or may not let us listen for the entire weekend. Be sure to check back with us for our conference recaps and for ideas on how to remind your family for the 6 months following conference about what was taught and how to keep that spirit in your home. General Conference is an AMAZING opportunity to teach your children more about the Gospel and our Church leaders! There are so many amazing outlets that can help us keep our children focused during General Conference. Below are some of our favorites! The Red Headed Hostess is always a win! her General Conference packets can be found HERE and they are AMAZING! They are not free, but definitely worth the cost! Maeser Art is one of our all time favorite LDS artists! He has recently started making Free General Conference Packets and they are so fun! You can find that packet HERE. Also check him out on Instagram @maeserart for amazing inspirational quotes and live time General Conference updates. You will not regret it! One of our favorite parts of General Conference is the ties! 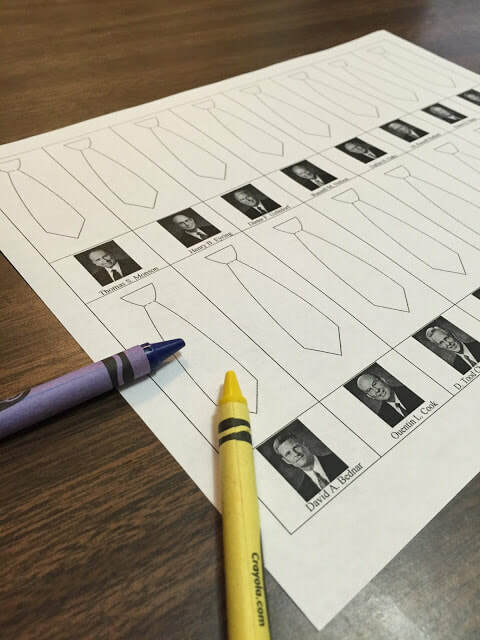 We have created a tie chart with photos and names of all the General Authorities for kids, or parents, to color as they are speaking. It's a fun way to keep kids focused and busy during Conference. 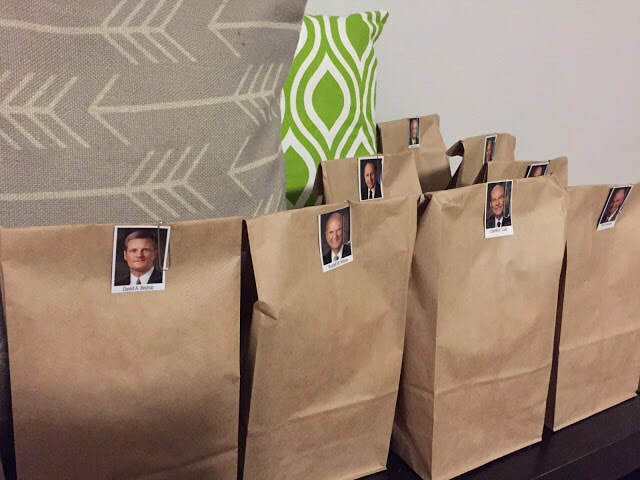 Another fun way to keep kids focused on General Conference is Conference Bags. We found pictures of each General Authority, laminated them, and attached them to brown paper bags. Inside each bag was a treat or a Dollar Tree toy that they could have when the General Authority whose picture was on the bag spoke. This definitely keeps the kids excited to see what is in the next bag and so they keep their eyes on Conference to see who speaks next! The best part about this is that you can always keep the photos and reuse them next Conference.